The Food Charter offers effective, publicly-supported ways to improve all Minnesotans’ health through changes in food environments and furthering collaboration within our food and farm economy. By implementing strategies outlined in the Food Charter, we can ensure a healthy, safe food supply—and support the state’s future prosperity, including reducing healthcare costs, increasing worker productivity, and supporting a robust food and farm economy. Minnesota is a food and farm economic powerhouse; we’re the fifth largest agricultural economy in the United States, and ranked the eighth best state for business. We can build on this legacy to ensure that providing access to healthy food for all Minnesotans also grows our food and farm economy. Implementing Food Charter strategies that strengthen technical assistance and financing options for food and farm entrepreneurs is an important way to accomplish this aim. If implemented, these strategies will create a robust, well-integrated system of food and farm technical assistance and financing. Many leaders and organizations across Minnesota have been leading the way in this arena and are now poised for further strategic collaboration. The Minnesota Food Funders Network (MFFN)—a group of Minnesota-based funders who make informed, coordinated, and strategic investments to improve key facets of our food system—has convened many leaders in food and farm financing to explore how to implement relevant Food Charter strategies and leverage their shared influence. MFFN has a common commitment to the vitality and prosperity of our state’s communities and resilience of our landscapes, which inspires their collaboration. On April 30, the Minnesota Food Funders Network hosted a strategic event, “Our Common Table: Creating and Financing a Healthy Food System.” Participants in this daylong session identified existing and needed assets to ensure robust food and farm financing and technical assistance with the aim of strengthening local and regional food supplies. With an emphasis on the interconnections between food, hunger, health, and agricultural issues, this diverse group of funders worked together toward concrete policy and systems changes that would ensure a healthy, robust food infrastructure for the state. The meeting has already catalyzed work in our communities—including investments in a number of upcoming projects to be announced later in 2015. 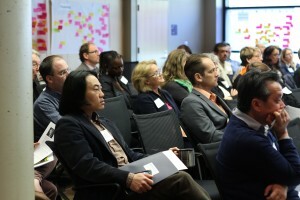 The Minnesota Food Funders Network is already planning ongoing conversations to further develop plans for this work. Interested in learning more about healthy food financing initiatives? A statewide financing program, designed to attract supermarkets and grocery stores to under­served urban and rural communities. Developed as a public-private partnership, FFFI served the financ­ing needs of operators in communities where infrastructure costs and credit needs were not met by conventional financial institutions. The initiative used market analysis, leveraged capital, and public policy to stimulate supermarket development and increase the availability of fresh food in low-income neighborhoods. The program, which began in 2004, ended six years later when all of its funds were deployed. 88 new or expanded stores led to 5,000 jobs, increasing access for nearly 500,000 people. A private-public partnership loan fund that was designed to: increase access to healthy food in underserved communities; spur economic development that supports healthy communities; and inspire innovation in healthy food. The fund has raised $272 million to invest in financing for grocery stores and other forms of healthy food retail and distribution by providing flexible capital to eligible applicants. CAFWF was modeled after the Pennsylvania Fresh Food Financing Initiative (above) and was developed to align with the National Healthy Food Financing Initiative (HFFI). Three retail locations led to $40 million initial economic impact with expected $30 million annual recurring impact. A public-private partnership loan (with a $30 million target) that provides financing & business assistance to good food enterprises that benefit underserved communities across Michigan. The Michigan Good Food Fund is working to: Increase Access to Healthy Food; and Drive Economic Development and Job Creation. They’re doing this by promoting equity, environmental stewardship, and local sourcing. Eligible grantees must focus on healthy food production, distribution, processing or retail and benefit underserved communities. By 2020, 20% of food consumed in Michigan will come from Michigan. To learn more about the Minnesota Food Funders Network, click here.